Go to original pattern for design DROPS 146-18. 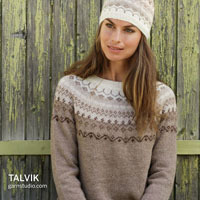 Knitted DROPS jumper with dropped sts in ”Alpaca Bouclé”, “Symphony” and “Cotton Viscose” or ”Alpaca Bouclé”, “Melody” and “Cotton Viscose”. Size: S - XXXL. DROPS STRAIGHT NEEDLES size 12 mm / US 17 – or size needed to get 8 sts in stockinette st with 1 strand of each yarn (= 3 strands) = width 10 cm / 4''. DROPS CIRCULAR NEEDLES size 10 mm / US 15 (40-60 cm / 16"-24") - for neck edge. K all rows. 1 ridge = 2 K rows. See diagrams A.1 and A.2. Diagrams show all rows in pattern seen from RS. On the rows where dropped sts are worked, make 1 extra YO inside the edge st in each side (i.e. 3 YOs on needle with large dropped sts and 2 YOs on needle with small dropped sts). Slip YOs off the needle on next row as before. This is done to avoid tight edges on the piece. Because of the weight of the yarn all measurements must be done by holding the piece up otherwise the garment will be too long when worn. Worked back and forth on needle. 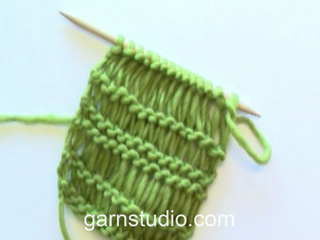 Loosely cast on 36-40-44-48-52-56 sts on needle size 12 mm / US 17 with 1 strand of each yarn (= 3 strands). Work 2 ridges in GARTER ST - see explanation above (1st row = RS). 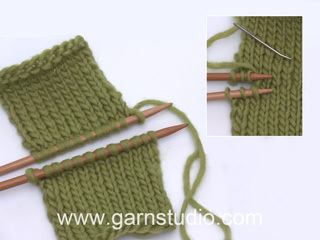 Then work pattern according to diagram A.1 with 1 edge st in garter st in each side - READ KNITTING TIP and REMEMBER KNITTING GAUGE. When piece measures 51-52-53-53-55-56 cm / 20"-20½"-21"-21"-21½"-22" - READ MEASURING TIP, cast on 2 new sts at the end of the next 2 rows = 40-44-48-52-56-60 sts. Continue A.1 with 1 edge st in garter st in each side - NOTE: It is important to also make 1 extra YO on the rows with dropped sts inside edge st in each side (slip YOs off the needle on next row). This is done to avoid tight edges on the piece. When piece measures 64-66-68-70-72-74 cm / 25¼''-26''-26¾''-27½''-28 3/8''-29 1/8'' - remember Measuring tip, bind off the middle 10-10-10-12-12-12 sts for neck from RS and finish each shoulder separately. Continue to bind off 1 st on next row from neck = 14-16-18-19-21-23 sts remain on the shoulder. K 1 row from RS and K 1 row from WS before LOOSELY binding off with K from RS, piece measures approx. 66-68-70-72-74-76 cm / 26''-26¾''-27½''-28 3/8''-29 1/8''-30''. Repeat on the other shoulder. Front piece is worked the same way as back piece but 10 cm / 4'' shorter vertically. Beg and work as on back piece until piece measures 41-42-43-43-45-46 cm / 16"-16½"-17"-17"-17 3/4"-18" - remember Measuring tip. Cast on 2 new sts at the end of the next 2 rows = 40-44-48-52-56-60 sts. Continue A.1 with 1 edge st in garter st in each side - NOTE: It is important to also make 1 extra YO on the rows with dropped sts inside edge st in each side as on back piece. When piece measures 50-52-54-55-57-59 cm / 19¾''-20½''-21¼''-21 5/8''-22½''-23¼'' - remember Measuring tip, bind off the middle 8-8-8-10-10-10 sts for neck and continue each shoulder separately. Then bind off for neck at the beg of every row from mid front: 1 st 2 times = 14-16-18-19-21-23 sts remain on needle. Continue to work until piece measures 55-57-59-61-63-65 cm / 21 5/8''-22½''-23¼''-24''-24¾''-25½'', K 1 row from RS and K 1 row from WS before LOOSELY binding off with K from RS. Sew the shoulder seams tog inside bind off edge. Pick up 24-26-28-30-30-32 sts from RS inside edge sts along armhole on needle size 12 mm / US 17 with 1 strand of each yarn (if more or fewer sts are picked up, inc/dec evenly on first row). K 1 row from WS. 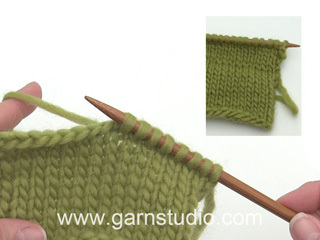 Then work pattern according to diagram A.2 with 1 edge st in garter st in each side - remember Knitting tip. When sleeve measures 4-4-2-2-2-2 cm / 1½"-1½"-3/4"-3/4"-3/4"-3/4" - remember Measuring tip, dec 1 st in each side. Repeat dec every 11-11-9-8-8-6 cm / 4 3/8"-4 3/8"-3½"-3 1/8"-3 1/8"-2 3/8" 3-3-4-4-4-5 more times (= 4-4-5-5-5-6 dec in total) = 16-18-18-20-20-20 sts remain on needle. 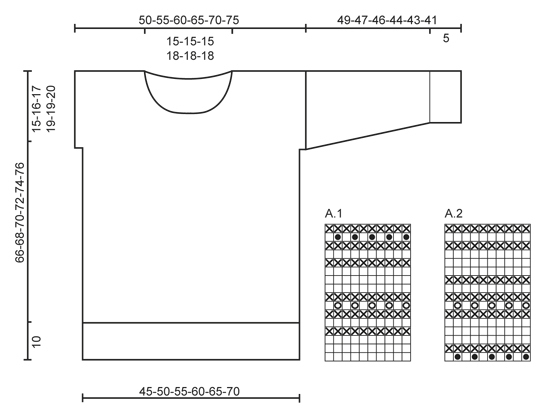 Continue pattern until sleeve measures 44-42-41-39-38-36 cm / 17 1/4"-16½"-16 1/8"-15 1/4"-15"-14 1/4". Switch to circular needle size 10 mm / US 15 and work in garter st back and forth until sleeve measures 49-47-46-44-43-41 cm / 19 1/4"-18½"-18"-17 1/4"-17"-16 1/8" (shorter measurements in the larger sizes because of wider shoulders). Knit another sleeve in the opposite side. Sew sleeve and side seams in one, sew in outermost sts, make sure the seam is not tight. Pick up from RS approx. 30 to 36 sts around the neck on circular needle size 10 mm / US 15 with 1 strand of each yarn (= 3 strands). 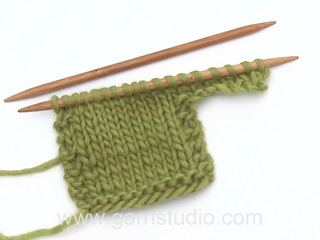 P 1 round, K 1 round and P 1 round, then LOOSELY bind off with K.
Could you knit this in the round, bottom-up until sleeves? Dear Joan, you could probably, but remember that back piece is here longer than front piece. Happy knitting! Bonjour Myriam, c'est parce que c'est la largeur qui est importante. Le point utilise fait que l'ouvrage va s'etirer sur la longueur. Bon tricot! I would like to knit this in a medium or dark grey. Could you give me the color numbers for each yarn or yarn alternative to knit this? I am having trouble matching up the grey color from my computer monitor. Dear Margaret, please contact your DROPS Store they will be able to provide you any individual assistance choosing colours matching your wishes. Happy knitting! 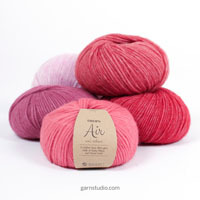 What yarns can be used for this pattern and how much yarn is needed? I have discovered that one of the suggested yarns is discontinued and I don't like the alternative. Dear Mrs Williams, This jumper is worked with 3 different qualities: Alpaca Bouclé (yarn group A), Symphony (yarn group D) and Cotton Viscose (yarn group D) - Only Symphony is now discontinued (but some stores may still have some) - please click here to find alternative and calculate how much yarn you will need in new quality. Remember you can get help from your DROPS Store even per mail or telephone. Happy knitting! Buongiorno, perdonate, sto lavorando da poco tempo ai ferri e sono alle "prime armi". non mi è chiara l'indicazione "Lavorare 2 “creste” a M. LEGACCIO", cioè se una "cresta" sono 2 ferri diritto, devo farne 4 a diritto? quando indicate 2 f. significa "andare e tornare" sul medesimo ferro? grazie, Luisella F.
Buongiorno Luisella. 1 cresta a legaccio, sono 2 ferri in cui si lavorano tutte le m a dir. Quindi 2 creste a legaccio corrispondono a 4 ferri lavorando tutte le m a dir. L’indicazione lavorare 2 ferri, vuol dire lavorare tutte le m sul ferro (1° ferro, ferro di andata), girare il lavoro e lavorare tutte le m sul ferro (2° ferro, ferro di ritorno). Ci riscriva se ancora in difficoltà. Buon lavoro! Brug den traad du synes ser bedst ud - Jeg ville nok bruge Symphony, da jeg tror den vil matche bedst i genseren. Love it. when can we get the pattern?